The damper climate conditions of the past couple of years have resulted in an increase in the occurrence of rising damp in the perimeter areas of concrete floors. Prior to this, several years of dryer conditions reduced the number of properties presenting with this problem. The problem now is quite common, and can be due to a number of factors. Rising damp can lead to serious deterioration of building elements if left unchecked for an extended period. Decay was noticed the skirting boards during a pre purchase inspection. The moisture meter indicates a problem to this garage floor. Today’s building methods have progressed from the days of medieval construction and concrete floors are now constructed with a moisture barrier (plastic sheeting) under the slab. Problems can arise from one or a combination of factors including, incomplete moisture barriers (e.g. plastic collapsing into trench during concrete pour), poorly constructed concrete with increased permeability, poor site drainage, inadequate detailing and / or installation of moisture barrier to the slab edge. The latter two being quite common. Moisture can also come from other than the slab edge due to poor construction practices and building deterioration such as poorly constructed / porous masonry walls, inadequate or damaged damp proof flashing, blocked or inadequate weepholes, poor installation of brick ties, roof and wall leaks. Rectification of construction problems can be complex matter for builders, but there are a number of recommendations that the home owner can follow to minimise the risk of rising damp problems. Most importantly, ensure there adequate falls to the soil and paths around the house to prevent water ponding or the soil becoming waterlogged. Ensure all roof areas have gutters and adequate downpipes that discharge water well away from the house and that they are kept clear of leaves etc. Consider applying a waterproofing compound to the slab edge below ground level if the plastic membrane has not been brought to the surface. Do not raise the soil too high against the building and ensure brick weepholes are kept clear and free draining. This information is provided for general guidance only and in no way replaces the services of professional consultants. At the conclusion of my building and pest inspection at Nambour today the owner of the house told me about a previous inspection of her property by another company. The other inspector had identified this small area of timber damage in her garage as termite damage and the purchasers withdrew from the sale. His entire inspection took 20 minutes maximum. He did not go on the roof, into the roof void or under the house. My inspection took two hours and included in that was the two seconds that it took to see that the small area of timber damage in the garage was wood decay caused by a small leak in the roof – very clearly not caused by termites. There are Building and Pest Inspectors and then there are Idiots. The problem is that the general public don’t know the difference and just go for the cheapest price. Of course he can quote cheap, he only spent 20 minutes on the job and the client would have been better served if he hadn’t turned up at all. Try to ask around and get a referral, not just from the agent handling the sale. Poor site drainage can lead to many problems in and around your home. Inspect around your property, especially adjacent to the house. After rain, a walk over the entire area will help to identify any boggy or obviously wet areas. Rain water run off can accumulate in pockets and be held, even on sloping sites and especially in clay based or impermeable soils. Lack of slope and concrete edging to this garden causes water ponding against the house. Water ponding under the house together with poor subfloor ventilation can lead to mould and rot attacking subfloor timbers. Water ponding against foundations, especially in areas with clay soil profiles, can lead to cracking in brickwork and even to serious structural failures. This can also lead to rising damp in floor slabs and brickwork which can cause serious damage to building elements as well as mould in the house that can be a serious health threat to the occupants. I recently conducted a pre purchase inspection on a seven year old home for a client and I discovered that bottom plate of the exterior wall frames was severely damaged by wood rot caused by rising damp to the extent that I could place my fingers under the wall frame where it should have been solid timber. Severe wet rot to the wall frame behind the wall sheeting. Rising damp can cause damage to various building elements. Moisture in and around houses is also very attractive to termites as they need moisture to survive, which is another very good reason to ensure proper drainage to all areas. It is very important to ensure that water cannot enter the subfloor area or pond adjacent to the house. Provide suitable gradients to all hard and soft surfaces and where necessary install in ground pipes and drainage systems. 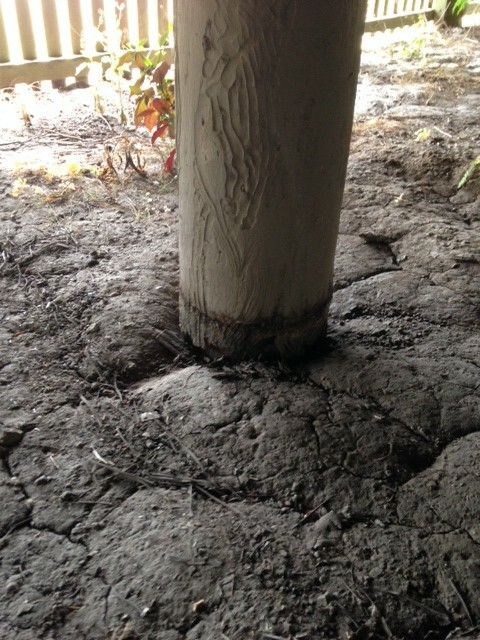 Damp soil / water ponding within the Subfloor area causes timber support stumps to develop wood decay. The can cause the bases of the timber support stumps to rot out and cause subsidence to the flooring of the house. This situation can be rectified by diverting all surface water runoff away from the perimeter and subfloor area of the residence. This may required a qualified plumber / drainer or could be as simple as grading the external soil away from the subfloor area. The timber support stumps may require leveling and packing. But in bad cases the support stumps may be beyond rectification and require replacement. If several support stumps require replacement and the installation of drainage is required, this exercise can be costly. The storm season is fast approaching! Many home owners are unaware of the condition of the roof exterior, framing timbers and holding down / bracing. Water penetrations & high winds can be very devastating and costly! A BPI Building Inspector can assess the condition of your roof, recommend the rectification required and also include photos within the report so you know exactly what we are talking about. The term “Dodgy Decks” is often taken a bit flippantly, but make no mistake, a poorly constructed or badly weathered deck can have deadly consequences. You may recall recent news reports of serious injuries and fatalities in the Nambour area resulting from collapsing residential decks. Residential timber decks are built for normal domestic use and can fail due to a number of causes such as poor construction, over-loading, and deterioration due to weathering. They should be inspected by a competent and licensed person every 12 months to check for signs of deterioration. They must be kept well sealed and ventilated to help prevent deterioration. If you are considering a large gathering on the deck, you are advised to have a structural engineer inspect and advise of the safe loading capacity of the deck. It is not just weathering that can cause a deck to collapse. Poor construction methods have been the cause of serious failures in the past, and often these two causes are waiting for an event such as a few extra people on the deck to set off the time bomb. The deck supports to this Bundaberg house are obviously “dodgy” to even the untrained eye, however most problems with decks are not so obvious and this is why they require careful scrutiny by an experienced professional. The Building Services Authority recommends that all structural framing members and their connections and support points below the floor level of decks and balconies should be unenclosed and not sheeted, to allow full visual inspection. If these areas must be enclosed and not visible for inspection then the framing and connections should be sufficiently durable to accommodate periodic wetting and drying, and all penetrations from the deck framing and fixings to the house walls should be flashed and sealed with permanent durable materials. In the case of one of the recently published Nambour failures, water penetration to the wall was one of the causes of the collapse. Rain water had been entering the wall cladding penetrations and rotted the house wall framing, which then caused the deck to collapse similar to the one shown in the photo above. · There was no visible evidence of a previous treatment to this home. · The recommendation for this home was the underfloor space be treated with termicide followed by yearly inspections. Thousands of homes fitted with recessed halogen down lights are potential death traps. These lights generate high amounts of heat and have the potential to start a ceiling fire. Ceiling fires are particularly dangerous as the fire can be spreading rapidly in the roof cavity without activating a ceiling mounted smoke detector and residents are not aware of the fire until the roof starts to collapse around them. I have frequently seen these lights installed too close to timber roof framing, or fitted into timber and hardboard ceiling panels. Another problem is roof insulation installed or displaced too close to the light. Regulations require loose fill insulation to be restrained by barriers around the light, but in my experience these are often either not present or so flimsy that they have collapsed over the light. Another unforseen problem is leaf litter that is blown into the roof cavity and can land on the lights. This light is one of several in a Brisbane home mounted in a hardboard ceiling. A Nambour home owner was lucky to escape a house fire recently when she smelt smoke coming from a light fitting. Fortunately the fire department arrived in time to extinguish the fire. A roof inspection revealed insufficient clearance from insulation to the light was to blame. There are approved light guards available to protect against these hazards but it is a very rare occurrence that I see them in a roof cavity. When you consider that halogen lights are very inefficient at making light and so dangerous, it makes sense to replace them with one of the much safer and more efficient options available today such as compact fluro or LED lights. Lighting retailers and licensed electricians can advise on the best options for your requirements.